Left to right, U.S. Sens. Richard Blumenthal, Chris Murphy and Chris Van Holland, D-Maryland. 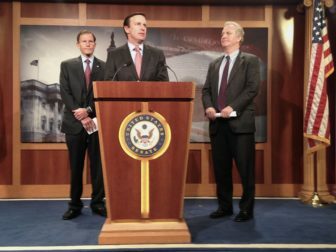 Washington – Connecticut’s Democratic senators, joined by a colleague from Maryland, on Thursday slammed the Trump administration for trying to “sabotage” the Affordable Care Act and demolish a health care system that has extended insurance coverage to millions of Americans. “Every single day, Donald Trump is working to demolish the Affordable Care Act,” said Sen. Chris Murphy, D-Conn.
Sen. Chris Van Hollen, D-Md., said the efforts to undermine the health insurance coverage of millions of American began on the day Trump was inaugurated, when the new president signed an executive order requiring federal agencies to “minimize the unwarranted economic and regulatory burdens” of the Affordable Care Act, which led the IRS to say it would no longer aggressively enforce penalties against those who fail to have insurance coverage. The erosion of the “individual mandate” requiring insurance coverage helped boost the premiums Blue Cross/Blue Shield of Maryland wants to charge customers next year, Van Hollen said. Aetna last week announced it would quit selling policies in all state exchanges and Anthem, one of two remaining insurers on Connecticut’s Access Health CT exchange (the other one being ConnectiCare), also has threatened to leave state exchanges — giving consumers fewer choices for coverage. Access Health on Thursday extended the deadline, from July 1 to Sept. 1, to allow Anthem and ConnectiCare more time to decide whether to continue selling policies on the exchange. “Sabotage is the operative word,” said Sen. Richard Blumenthal, D-Conn.
Trump has said Obamacare is “exploding,” with fewer choices and higher premiums for consumers. Insurers requesting rate increases from state insurance departments are asking for hefty boosts in premiums. In Connecticut, Anthem has asked for an average rate increase of nearly 34 percent for the policies it sells individuals on and off the exchange, and ConnectiCare has asked the Insurance Department for an average rate hike of 15.2 percent on policies it sells through Access Health CT.
House Speaker Paul Ryan, R-Wis., pointed to Maryland Blue Cross/Blue Shield’s request for a 50 percent rate hike as evidence the ACA needs to be repealed and replaced by a GOP plan the U.S. House approved on May 4 . Murphy said the Trump administration has a “systematic, planned” assault on the ACA that includes failure to commit to continuing cost-sharing payments to insurers that subsidize co-payments and deductibles for low-income Americans. Several insurers, including Anthem, say they will quit state exchanges if these payments are not secured, but Trump has committed to making them only through May. Murphy said the tactic is “cunning,” creating uncertainty for insurers while stopping short of taking a step that would put the Trump administration at fault for destroying the ACA. ‘If you are an insurer, how the heck can you price a product with this uncertainty?” Murphy asked. A group of 13 GOP senators are trying to craft an alternative to the House GOP health care plan, called the American Health Insurance Act.